It took all I had, and when I became empty and tired, it deserted me midway. There are few words in life whose meaning can be understood to an extent, only once you have lived life in all its dimensions. You have loved, cried, laughed and looked at the vast, dark open sky for years and years. You have meandered into the world, in search of something that you know but you don’t know. When something in your interiority has been touched, this nameless something also changes the inner core within you not just for this lifetime but for all lives that you are going to live that moment onwards. 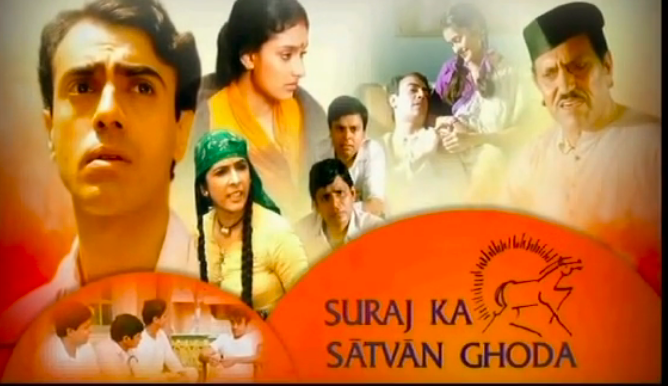 Suraj ka Satvan Ghoda (Seventh Horse of the Sun) written by Dharamvir Bharti is one such book. It has been adapted into a movie by the same name by the great filmmaker Shyam Benegal. Years ago, I saw this movie on Doordarshan as a kid. No need to say, as a young girl, I was charmed by the cute and innocent looks of Rajit Kapur. It was only two decades later, and I could understand the multiple layers his character Manek Mulla had. Manek Mulla is the principal storyteller, who weaves magic with his impromptu short stories. Every evening, his three friends come to his place where he entertains them with his stories. His stories on the surface may look like a regular romance story of a typical middle-class existence where love, deceit, and all related emotions are enmeshed. But they have deeper meaning and significance. They are a metaphor of understanding the socio-economic realities of life and also subtly pointing towards profound philosophical questions of existence. Is there any meaning to the evenings that I have spent in the arms of my beloved? Is there any meaning to love? What is love? Is this love or is that love? Can love be defined? Should love be defined? In my view, one can easily replace love with life in the above questions, and we can still arrive at the same conclusions. These are some of the questions, Manek Mulla is drawing our attention towards so that we can explore life through all its complexities. We get a glimpse into the lives of three young women Jamuna played by Rajeshwari Sachdev, Lily by Pallavi Joshi and Satti by Neena Gupta. Manek Mulla is a narrator and also a character who gets embroiled in a relationship with these three women under different circumstances. We see these women from different perspectives and at different times through the eyes of the narrator. All three women are attracted towards Manek Mulla and look upon him as a pillar of support. But it is to be noted that none of the women is depicted as a weak victim. Each of them fights her circumstances without the help of Manek in their unique manner. It wasn’t evident whether Manek was in love with them. It is up to the reader to decide if he loved them! When his friends point out that Manek never loved these women, he responds by using Upanishadic phrase Neti, Neti, i.e., this is not Brahman, and that is not Brahman. We all keep searching for that ‘something in life’ that completes us and gives meaning and purpose to life. The seventh horse of the sun will show us the way and guide us through the maze of life. Previous Is it ok to not have a Child?